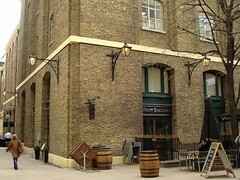 Modern European restaurant with South African influences, very near London Bridge. It opened in August 2008, and it's the second branch in the Vivat Bacchus chain, the original Vivat Bacchus being in Clerkenwell. It's divided into two parts, with different levels of formality. The ground floor is a wine bar which also serves sharing platters (as of October 2008, from £10.50 for the New York platter to £14.50 for the English platter) and tapas. Downstairs, there's a 60-seater fine-dining restaurant. There's a reasonable amount of outside seating too, which probably works on the same basis as the wine bar. Kake and bob visited on a Saturday evening in October 2008, two months to the day after it first opened. When Kake arrived at 7pm, the wine bar was only sparsely populated, and there was no problem finding me somewhere to sit and drink wine and wait for bob to arrive. Service was friendly, if a little disorganised - three different staff members asked me if I'd be eating, and I had to ask twice to get a glass of water. There was background music; quite lively, sort of flamenco-ish, and not too loud (though I'd not have wanted it any louder). It's worth noting that although they're happy to serve tap water, they also sell Vivreau mains-fed filtered water, a nice compromise for people who don't like tap water but also don't want to be eco-unfriendly. We decided to eat downstairs in the restaurant; it turned out that down there we were the first customers of the evening, though it got about half-full later on. Service was again friendly - one chap in particular made a point of exchanging snippets of conversation with us throughout the evening - and again a little disorganised, though not annoyingly so. Another point in their favour is that at no point did they overpour our wine; even when we were near the end of the bottle there was no attempt to overfill our glasses to persuade us to order another one. The restaurant space is actually quite nice; you don't realise you're in a basement! We got a little pre-starter freebie; liver pate on a small round of brioche, with tiny bits of pickled vegetables on top. The pate was a bit cold, and overall it was unexciting, but hey, it was free. Kake started with the ostrich steak tartar with smoked paprika chips, quail egg, and mixed salad (£8) photo. The chips (crisps) were basically just crisps, and not particularly good ones either. The salad was fine, though, and the tartar was good; quite vinegary/pickly, but I like that sort of thing. I did think the tartare portion was a little small for the price, though I might have been happier had the chips been more interesting. Gold star for the service at this point; I noticed one waiter hovering politely at a well-judged distance until he'd seen that I knew what to do with the raw quail egg (tip it into the steak tartare and mix it up). bob's starter was the seared peppered kudu carpaccio with sauteed girolles, apricots, and rocket salad (£9) photo. For mains, Kake had roasted line-caught wild seabass fillet with grilled portobello mushrooms and vermouth and lemon glaze (£15.90) photo. The fish was cooked well, with crispy skin and not overcooked inside. The portobello mushroom (singular) was disappointing; they'd cut off the tasty gills on the outside to turn it into a (admittedly attractive) square consisting mostly of stem. Even though this cost nearly sixteen quid, it didn't come complete; our waitress confirmed that I really would want a side. I had some chips (£3.50), which were long, skinny, crispy, and just fine apart from being pre-salted, which didn't work very well as the rest of my main was also fairly salty (and I like salty things; this was just a bit too much). bob's main was roast loin of springbok with a herb and mustard crust, served with roast beetroot, celeriac, and butternut squash (£18.50) photo. We had a brief look at the dessert menu, but we'd pretty much already decided that we wanted to have a go in the cheese room. One feature brought over from the Clerkenwell branch is the idea of a "cheese room" where you can go and taste a variety of cheeses under the guidance of a staff member, and then choose your favourites to enjoy back at your table. Although the cheese room here is quite small - more of a cheese cupboard - they had a good selection, and the staff member who was helping us choose was both friendly and knowledgeable. Apparently there's also a cheese room upstairs, and I may well pop in some time just for that and some wine. The overall bill was £70/head, which I feel is a little expensive. Although we did have a couple of glasses of port with our cheese, we only had one bottle of wine (plus a glass for Kake upstairs). The prices are similar to those at Magdalen down the road, but at the moment I'd say Magdalen is better value. Ewan and Kerry visited on a Saturday evening in March 2010, and tried their tasting menu (£79 with wine flight) photo, having no problems booking a table the same day. Again, service was excellent and attentive, with the sommelier showing particular interest in the food/wine pairings. Our meal began with some good sized rock oysters photo, followed by a decent open mackerel tart photo. The centrepiece was the peppered ostrich fillet photo, nicely cooked (it was a good, red colour inside), but still quite tough, though the matching wine was really excellent. An attractively-presented cheese course followed photo, denying us the opportunity to go into their cheese room (they indicated this was because of the wine matching, though it seems like an ill-considered move, given the cheese room is one of the selling points of the restaurant), finished up with a cherry clafoutis with vanilla ice cream photo and a glass of dessert wine they almost forgot about until we reminded the sommelier. In all, the service was excellent and the food well-prepared with nothing really disappointing among all the courses, though it seemed more like an extended meal than a tasting menu in the classic sense (portion sizes seemed fairly regular). Accessibility: There's a lift to get downstairs, and an accessible toilet down there too (I didn't check inside either of them though). Given this I would guess there's step-free access to get in, but I'll have to go back to check properly. Last visited by Ewan and Kerry, 20 March 2010. Opening hours taken from the Vivat Bacchus website, May 2013. Last edited 2014-03-22 16:44:32 (version 14; diff). List all versions. Page last edited 2014-03-22 16:44:32 (version 14).